in 1984, in only his second tour de france, robert millar finished in fourth place, and won the king of the mountains polka dot jersey. it was therefore logical that we had every right to expect more of the same in 1985. in 2009, bradley wiggins was able to equal robert's fourth place, and was climbing with relative ease, so not only the media and fans, but also team sky thought it logical to expect and to aim for better in 2010. paris-roubaix, 2004, magnus backstedt took the finish in roubaix velodrome to convincingly win the race for the first time. as with almost every winner of this particular race, the expectation and logic was that he would stand atop the podium once more in subsequent years. similarly, george hincapie, having come so close to that roubaix finish so often in his career, it was logical that his year would come. based on the above, what is seemingly regarded as logical seems not to be as logical as logic might dictate logical to mean, therefore it behoves us well to take, with a few milligrams of salt, the statement that rapha's easing itself into the role of cycle purveyor is a logical move. to the best of my knowledge, few, if any, other cycle clothing manufacturers have announced a compact and bijou range of cycles, albeit constructed by third party suppliers. that's not to undermine their strategy, because i think it an appropriate addition to their ever-expanding range. but i'd never have said it was logical. "we really began talking about this around the time of our collaboration with independent fabrication a few years back with the cyclocross kit and bicycle. the notion of creating an emporium has always allowed us to think not only about cycling apparel; by continuing to think about what we as cyclists would want as consumers, it takes us to areas like bicycles, music, skincare and so forth. the launch of the rapha bicycle collection is an exciting opportunity for us to collaborate with builders that we respect on bicycles that we are drawn to. it's our first undertaking to bring bicycles into the emporium and we are excited to be underway. and it's logical to think bicycles will be a part of the offering in future. 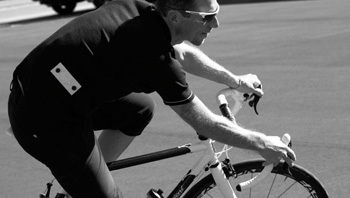 rapha's north american manager, slate olson. there's that word logical again, but surely used in a retrospective fashion. everyone is now agreeing that it was a logical next step, but that's a simple statement to make with an honours degree in hindsight. how many members of the public and media predicted this logical development before it was made manifest? so perhaps, if you'll forgive my unstinting aim against the notion of logic, you will allow me to substitute the word welcome; given what rapha have brought to the table, and what slate refers to as the emporium, who can possibly doubt that they will not present us with bicycles we barely knew we wanted before the pink stripe appeared down the centre of the mudguard/fender? the choice of bicycles is, i would tender, anything but logical, for who, with foresight, would have expected to see the beloved every day; come to that, who'd have thought a bicycle would inhabit such comfortingly eccentric name. but by way of justification of its inclusion, beloved owner, james selman was happy to remind of this highly complimentary affectation from rapha/embrocation journal's jeremy dunn. "this bike did a strange thing for me though. evoked a different feeling. one that went sort of like this... i'll try to explain it the best i can... it made me think to myself 'well, i don't have one of these' in a way that made me want to cruise around the neighborhood. you see, i do not get the opportunity to cruise much. even when riding to and from work i feel like it is always a race...Êi do not do well with cruising, or sitting around. i am trying to change that though. you know, go for a cruise around the block every once in a while. read a book or something. stroll through the park every once in a while...Êthat is kind of what this bicycle does, or is aiming to do. take something sporty like a road bike and sort of find the balance between the race and the cruise. "Ê mr selman and i are agreed that we probably couldn't have put it better ourselves. beloved bicycles are now being built at the chris king plant in portland, in conjunction with the chaps who build my beloved cielo (see what i did there? ), and knowing that rapha's north american headquarters are based in that city, it is not too much of a stretch to include (logically?) 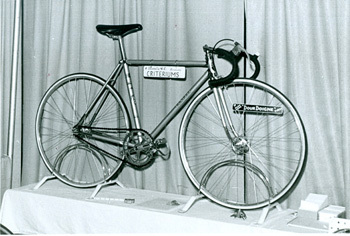 a second bicycle from the area and second out of three built in north america. 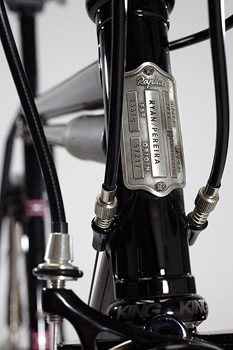 this second portland bicycle has perhaps the greatest connection to the rapha ouevre, being the result of a collaboration between two rapha continental riders: tony pereira and ira ryan. in fact this is the continental bicycle, resulting from literally thousands of miles ridden across the obscure backroads of north america. 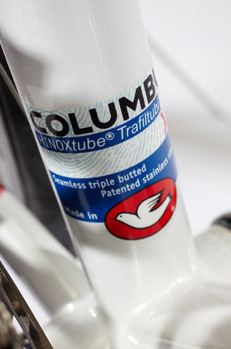 its provenance is amply demonstrated by both builders' names on the downtube, and the inclusion of a frame-fit pump under the top tube as standard. as mr olson testified:"both are dear friends and long-time partners of the rapha continental as riders and the original builders. we think of these two as 'two great things that go great together', and we're excited about them working together for this limited offer." that frame-fit pump? ira ryan: "yes, both of us felt the original rapha bike should have had fenders and a pump. it should be the go anywhere, anytime, any road bike." as to the collaboration between the two builders, i asked ira if they'd be building each bicycle individually, or half each. "tony and i come to the world of bikes and framebuilding from similar roads and have found each other to be good friends as well as working together on a few smaller random projects. this just seemed like a natural progression for our respective brands. we both have our own ideas of how to build a frame but also push each other to learn different techniques. he is a master with fillets and i prefer the use of lugs, so having a bike that combines both styles is a good way for us to work together and provide years of riding experience to a medium production framebuilding project". i asked tony pereira who would get to do the good bits; "it's all good bits! honestly though, i'll probably do more of the fillet brazing and he more of the lug brazing, but that's the easy part. i remember the first time ira told me about the rapha continental: 'we're going to travel around the country in a van doing all the best rides.' he said. i replied "how do i get in on that?" it wasn't long before we were actually doing it and its been an incredible experience. the rides are every bit as tough and beautiful as they sound and look. we both feel very lucky to be a part of it." the collaboration with independent fabrication (or indyfab as i find easier to type) was, from my point of view, perhaps the least predictable, if only because the two have worked together previously. rapha's first custom built cyclocross kit, consisting long-sleeve lightweight jersey with padded right shoulder and bib threequarters, were available in two flavours; one simply brown with orange detailing, one highlighted with the indyfab logo strategically placed about its person. 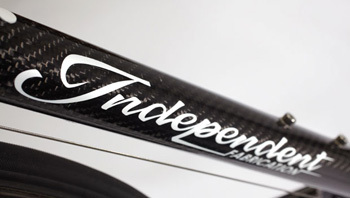 other indyfabs have been seen sporting a rapha logo on the headtube, so i really didn't see this one coming; rapha are not prone to repeating themselves. again. that an indyfab creation is one quarter of the panoply of fabulous machines, is a welcome state of affairs, but it breaks with tradition slightly, by being the only model to eschew steel and nod towards the exotic with carbon fibre and titanium. was this a deliberate ploy to instil differentiation? "not deliberate beyond the xs being the obvious choice for the sportif/grand fondo position within the collection, especially with the direct experience of a few rapha staffers such as simon richardson, who is no slouch on the bike. Êi suppose the bike is also a bit like rapha clothing, utilising modern technology to enhance performance, but managing to retain a sense of craftsmanship and understated style, with lots of small details that don't scream at you." gary smith of independent fabrication. rapha's seven year heritage has been substantially based on the black and white, european heritage amply demonstrated through their website and the pages of rouleur. what ben ingham did next. so logic yet again enters the fray, introducing that fourth model and the only one not just from europe, but more specifically, from italy. cinelli is a strong, popular and traditional choice, but as slate olson mentioned, "there was no official application or standard measure for the partners in this collection.Êwe have a love and appreciation for so many bicycle manufactures around the globe, that choosing only four was very, very difficult. you are likely surprised that there is no colnago, given simon mottram's (rapha ceo) passion for his c-50 and eps bicycles." i asked cinelli's lodovico pignatti if he could tell me why he felt that they had been chosen to be represented. "good question!Ê iÕd like to hear raphaÕs answer to that as well!Ê i think it began a couple of years when antonio colombo (cinelli president) and myself met up with simon mottram and told him how much we liked the continental project theyÕd done in the states, how as a brand theyÕd managed to capture the look of competitive (and non-competitive) use of steel frames in a way that was new and exciting, something that both as columbus and cinelli, weÕd never lost sight of (this is as much a collaboration with cinelli as it is with columbus. we share the same owner and factory space).Ê we told simon that if they ever launched a similar project in europe, weÕd like to be involved, that weÕd like to do those kinds of rides in italy!Ê i guess through keeping in touch, working together on smaller projects, we came to this more formal collaboration.Ê weÕre honoured to represent europe, and more specifically italy, to give a touch of that exaggerated flare which our culture allows, and perhaps others donÕt." nobody would be naive enough to relate beloved's 'every day' model with the rapha ideal of pain and suffering, rightly or wrongly an ideal more readily associated with european racing, perhaps specifically with belgium or italy. in this respect, cinelli seem almost to be the sole representative of those grainy, black and white photographs. does lodovico think this perhaps swung the pendulum in their favour? "i think more than fulfilling the Ôpain and sufferingÕ ideal, we understand and share raphaÕs classical appreciation of the sport, with its focus on narrative arc, heroes and villains. the old literary cycling world before television, where the race was retold in newspapers the next day using the dramatic conventions of the day.Ê when coppi really was a giant to the entire country. in italy we call it 'il grande ciclismo'.Ê more than just sharing this sensibility, weÕre part of its foundation. one of the companyÕs claims is 'cinelli Ð the history of cycling'.ÊÊhistorical cycling product, artworks and ephemera litter our offices, products which will be listed when people look back in 100 years and ask Ôwhat was a racing bicycle in the 20th century?Õ (whether it be the 1a stem, the giro dÕitalia handlebars, the laser etc.). above our head of sales' desk there is an enormous enlargement of an extract of dino buzzatiÕs reportage from the giro of 1949. and on a nearby wall, a drawing by legendary italian artist mario schifano; written boldly and enigmatically across the surface 'anquetilÕs my chief, not you' a snippet of overheard dialogue from a race start line.Ê this understanding and appreciation is something which is always concretely articulated in our product, and never more so than in the new cinelli rapha collaboration (have a look at the photo below of what cinelli used to sell in the usa as a criterium specific bike!)". so there we have the four bikes, the four sections applicable to the rapha bicycle collection: urban, epic, sportive and race, all aspects of the rapha we have come to know and love. but unlike the wide range of clothing, none are designed or built in-house. these are, as several of the above have been keen to point out, collaborations, so apart from the trademark pink, were rapha stringent in their diktat to the builders? slate olson: "we were pretty intimately involved with each bicycle; it was more than a wave or command. we talked with each partner about the full vision for the collection and worked with them to select their bicycle for the range of riding needs we envisioned. rapha developed a core color palette that helped to unite the bikes, but asked each builder and painter to best interpret that palette for their particular bicycle. we came to them ultimately because of our respect for what they make, so while we had opinion, we really looked to them to help us answer the goals for each type of rider." james selman, beloved cycles:"we were pretty much left to our own devices around the bike, only the design parameters around making the most of theÊevery dayÊplatform, which we'd all agreed upon. the only brief from rapha per se being the color palette of course, was to make it more a city 'racer (quickly coined as the 'speedster') and to use their head badge. it was nice to be able to collaborate on this aspect too; as designers, we have a passion for figuring things out in a collective format." tony pereira:"rapha didn't give us too many design parameters. we all agreed that 'the continental bicycle' would take a certain form, but they didn't dictate much more than the colors". considering the breadth of this project, and its almost organic conditioning, it seems likely that the bicycle collection has the potential to become greater than the sum of its parts. i mean by this, the collaboration between builders that may not remain the preserve solely of this project. but one also, as devil's advocate, has to quiz the exclusivity of each model. 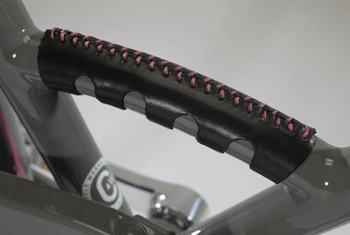 because it would likely be just as easy to stick on a rapha head tube badge and a couple of splashes of pink somewhere. can the bubble be burst, and what of a future related to these four bikes? lodovico pignatti at cinelli again; "we have offered a ÔstockÕ cinelli xcr frame since the general introduction of the material in 2008.Ê the rapha frame uses the same tubeset but the toptube is non-sloping for the collaborative model.Ê the other principal difference is the geometry, which has changed from italian stage-race to a much more aggressive 'crit' feel." beloved's jame selman was a tad more specific about their portland built 'speedster'; "the main variables between our 'stock' every day and theÊevery day speedsterÊis that very idea of rapha, a bit more available head-down speed to the "commute through the city" idea, really sharpening the details per the gentleman, or gentle-woman, as it were. first attention was given to the bar, something more 'cafe racer' with the nitto priest bar (which we liked so much it's now also the stockÊevery dayÊbar). then, making it a five-speed, just enough range for around town but keep the bars looking fast, clean and able with a tried and true down tube shifter. 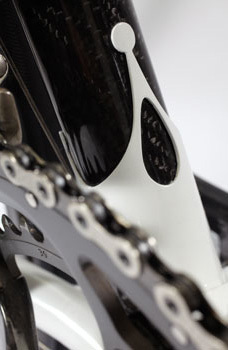 we looked to upgrade with paul components for their buttery classic but modern silver crank, brakes and levers. next was framing the badge with a white head tube and painting the fenders with a pink pinstripe, leaving a chrome rear tail flapÊfor those signature rapha touches. but the main accoutrements areÊpartnering with a few makers to create special personal bits for this every day; san marco for a regal saddle inscribed with rapha and speedsterÊpanels, paul for a 46T large circles chainring inscribed with 'for beloved and rapha,' and local walnut sudio for leather pieces on the bar (two piece black/grey), carrying handle (with pink thread) and toe clips." the continental bike is delivered as is; there are no customisation options available. but do messrs pereira and ryan see themselves using this experience to collaborate on future projects of their own? ira ryan; "we'll see. this is a chance to learn more about production and batching out runs of frames. i always say a rising tide lifts all boats, and i think the project will be good for tony, me and rapha." i'm sure it's plain to see what rapha gain from all four associations, and the kudos garnered from offering this range of superb bicycles. but accepting that all four are well established in their own right, managing just fine before perren street came knocking, what do they get from working with rapha? 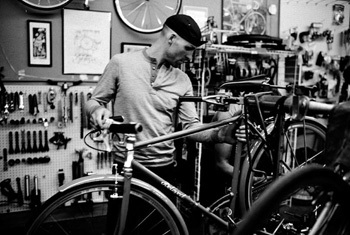 gary smith of indyfab; "we get to build nice bikes, work with fun people, and expand our brand voice through the sophistication of rapha's marketing capability. they do a great job of presentation, whether it's catalog, online, or one of their pop-up stores. Êalso, their customer is a very discerning one, so that helps us elevate our game. "we're thrilled to continue our association. Êaside from the pure business potential, simon and slate are a real joy to work with, and that matters most to me. Êthey care about product first and foremost, and they live cycling." of course though the offerings are currently four, there is almost a fifth collaborator, one briefly mentioned at the start, but just as essential as the tony pereira 'pear' signature badge. i refer to chris king precision components. 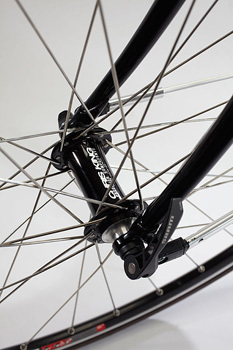 aside from the beloved every day speedster being constructed in their nw nela street premises, it also features a ck headset and front hub, while the 'continental' bicycle features a pair of chris king wheels and the ubiquitous headset (perhaps a ck bottom bracket?). the indyfab can be specified with a variety of contemporary componentry which could just as easily include those ck components. and while we've been refering to all four as rapha bicycles, in point of fact, only the beloved and continental models arrive in that form. the indyfab and cinelli offerings are frame and fork only. so, is this the beginning and the end? in the manner of all things rapha (witness the london and nyc cycle clubs), nothing is deigned to last forever; offerings end and change. whither the future of the bicycle range? slate olson; "we have an initial agreement for these four bicycles and makers, but would be keen on either expanding the offering to work with other brands we admire down the line. that is our plan." i would like to offer personal thanks to those who assisted greatly with the writing of this article; lodovico pignatti, james selman, gary smith, chris distefano, slate olson, tony pereira, ira ryan and simon mottram.